April 5, 2018 - Essity announced that it is restructuring its Consumer Tissue production in Spain. The measures include the closure of a tissue production facility in La Riba and the closure of one tissue machine at a production facility in Allo. 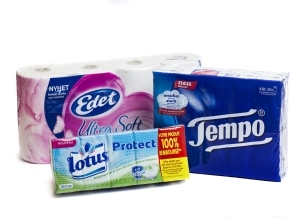 Essity was formed in June 2017 and formerly operated as SCA's hygiene business, which included the business areas of Personal Care and Tissue. Essity did not disclose capacity figures accociated with the closures, but in SCA's 2016 Annual Report, the La Riba plant was listed as having a production capacity of 26,000 tons per year of consumer tissue, while the Allo mill operates three tissue machines with a combined capacity of 160,000 tons per year. According to Essity, these measures are aligned with the company's strategy to optimize the production footprint to increase cost and capital efficiency and further increase value creation in the Consumer Tissue business area. Essity is a leading global hygiene and health company dedicated to improving well-being through our products and solutions, essentials for everyday life. To learn more, please visit: www.essity.com.